Yes, now there is increased awareness about infection control in the tattoo studio environment, both artists and consumers are changing to adapt to today's standards of health and safety through education. There are a number of items to look for to ensure your peace of mind and understanding that your chosen studio is performing basic standards. Is there an autoclave on site? Is single service of materials and equipment provided? Are gloves being worn? Is the environment clean? Are contaminated materials properly disposed of? ASK QUESTIONS! What is an autoclave? An autoclave is a machine that will kill any known living organism. This is not to be confused with toaster ovens, dry heat units, boiling of needles or soaking equipment in alcohol. Autoclaves use heat, steam and pressure at temperatures above 270 degrees Fahrenheit for at least 55 minutes from a cold start. ASK TO SEE ONE! What does the term "single service" mean? This means that each needle and tube set is individually packaged, dated and sealed, then autoclaved. There is a small icon on the bag that will change color when proper sterilization has occurred. The use of dated "spore indicators" as part of the sterilization routine ensures microbial death and is an added measure of assurance. What about the material? Any ointment, pigments, gloves, ink, ink caps, needles etc. used in applying your new tattoo are discarded after use. NOTHING is re-used! After the tattoo application, the artist will disinfect the work area with EPA approved virucidal that kill any surface bacteria or viruses. Hepatitis B can live in dried blood for up to ten days! Can I get AIDS? It takes 100 microliter of blood and a deep intramuscular puncture to transmit the HIV virus. This is equivalent to 10 drops of blood. Since needles used for tattooing are "solid core" (not hollow like syringe) and HIV does not live outside the human body too long, it is unlikely. There has never been a documented case of "getting AIDS" from a tattoo. Yes, but it's not as bad as you might think. The pain comes from the needle group in the tattoo machine hitting your skin very rapidly. This sensation, however, doesn't feel like the pain of an injection it's more of a constant irritation. The pain will also vary according to where on your body you get worked on. Areas of the body that have bones close to the surface (collarbone, anklebone, ribs, etc.) tend to be more painful than other areas. Different types of needle groups tend to feel different. The needles used for outlining produce a sharp, hot, and more noticeable pain, though the outlining is USUALLY the quickest part of the tattoo. The needles used for shading usually produce an abrasive and hot feeling, which is more tolerable for most people. Do not drink alcohol or take drugs for pain relief purposes prior to your tattoo sessions. Both aspirin and alcohol thin your blood and promote excessive bleeding. Aspirin also decreases the clotting of blood, which will slow down your healing as well. In addition, artists do not appreciate tattooing people who are under the influence of alcohol or drugs. I personally view the pain part of tattooing as a challenge to be overcome. When I get tattooed and it hurts, and I can still make myself sit there and allow the experience and not have it get the better of me; then I can leave with a bit more than a tattoo. I can leave with the sense that I am stronger than a lot of things I once thought were stronger than me. My tattoos have then become talisman if you will, to remind me of this lesson every day. People get tattoos for different reasons. Some want to look good, others use tattooing as a symbolic mark of personal transformation. Either way remember it is permanent and you will want to give it much thought BEFORE you have it done. This is something you will live with for the rest of your life you should be VERY happy to have it. Make sure it does not turn into an embarrassment. You can get a tattoo anywhere on the body. You may want to keep in mind a few things though. First, do you want your tattoo to be seen when you go to work? You might want to make sure the tattoo is in an area that you will not have to put extra thought into making sure it is always covered up for work. Second, if you are planning to have more tattoo work done later try to have at least a rough idea of the complete plan for the area. This way you will prevent future design problems. Third, larger tattoos are usually better as you will avoid having a lot of small stuff that eventually will be a problem to incorporate into a larger theme. Finally, hands and feet are unique as the ink tends to wear off these areas easier. I do not tattoo faces. What color can I get? White is the first color to revert to skin color if exposed to the sun. It should be reserved for small things like highlights, teeth and eyes. Red is another color that will fade rather quickly- so if you are in the sun a lot you may want to skip red. Additionally, red is a color that not everyone can hold well. Before having a large amount of red put into you, first you might try a small amount and see how well you hold it. Black is the hardiest of the colors. It stands up to sun and wear better than other colors- so if you are in the sun a lot you might opt for black. You can get just about any kind of design tattooed on your body; the only limitation is your imagination. You can find tattoo design ideas everywhere, clip art sources on the WWW or in books, art books, comic books, yours your children's drawings, tattoo magazines, etc. Tattoo designs fall basically into two categories: 1. Flash and 2. Custom. Custom designs are designs that are original one of a kind designs made in collaboration with your chosen artist. Usually a client will bring in some inspiration such as- a record cover, T-shirt, card, panting reproduction, etc. and explain to the artist what they would like to do with it such as- I want it on my shoulder, smaller than the original, and the colors to be different. The artist will then work on developing the drawing to the specifics of the client. I do not tattoo names. It is not advisable to get a tattoo while pregnant or nursing; though it is unlikely getting a tattoo will hurt the fetus or nursing infant. The problem will be in the quality of the tattoo. While pregnant the body is working overtime and the tattoo will possibly heal harder and possibly result in a light tattoo. Additionally, while pregnant many women put on extra weight that will come off after the pregnancy. The extra weight will cause the tattoo to be distorted once the weight is lost. While nursing a woman's body produces antibodies that are to be passed to the infant. If tattooed while these extra antibodies are in the system the tattoo may heal harder and possibly result in a light tattoo. If your desire is to get the best quality tattoo I suggest that you wait until the pregnancy and nursing are completed and then get the tattoo. If you decide to go ahead and get the tattoo while pregnant or nursing please consult your tattoo friendly physician first. Yes, though there are a few things to consider when getting a tattoo over a scar. First, the scar must be at least 1 year old before you get the tattoo. This will give the scar enough time to have completely healed and regenerated before attempting to cover it. Second, to hide a scar it is better to have a busy pattern covering the scar than a solid color. For example, a wing design over a scar will hide the outline of the scar by detracting the eye from the scar. However, a solid tribal piece will let the scar show through and will not accomplish the goal to hide the scar. Finally, a scar may not take the ink as well as normal skin. You might need to come back for another session to get a solid fill over the scar. 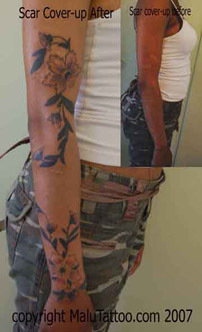 I do not guarantee scar cover-up tattoos, any necessary touch-ups will be at the client's expense. Here is an example of a tattoo scar cover-up. It is the same idea for a tattoo tummy tuck scar cover-up as it is for any scar cover-up (see above). The scar has to be at least 1 year old before you can get the tattoo. And a busy pattern is a better choice to distract the eye. Here is an example of a tattoo tummy tuck cover-up. How to old do I have to be to get a tattoo? You must be at least 18 years old with valid identification to be tattooed at Malu Tattoo. We ID everyone and make a copy of your ID to attach to your consent form. No exceptions. We do not tattoo minors even with the consent and/ or presence of the parent or legal guardian. We are very strict about this rule for two reasons. First, a bill was passed in the California Senate called AB186 which makes the legal age 18 for all tattooing within the state of California. This bill does not provide for the parent or legal guardian to allow a minor child to be tattooed. Second, if your desire is to get the best quality tattoo it is not advisable to get tattooed while still growing. A well placed tattoo today my not be well placed once you stop growing. Your tattoos should be a positive experience. If your desire is to get the best tattoo possible, I recommend that you wait until you are 18 and use the time between to plan your tattoos. The following is a list of suggestions to make your tattoo appointment more comfortable and enjoyable experience. Make sure to eat a few hours before your appointment. Some people get light headed or faint if they have NOT eaten before getting a tattoo. Make sure to drink plenty of water the day before and day of your application appointment. Give yourself enough time for your appointment plus some. Feeling rushed tends to add to the anxiety. Wear clothing that can easily be removed from the part of the body that is going to be tattooed. For example; you might want to wear sweat pants for a lower back tattoo. Wear clothing that you don't mind getting ink on. Tattoo ink tends to stain so don't wear anything that you don't want spoiled with ink. Do not drink alcoholic beverages or take blood-thinning medications as both will thin your blood and make you bleed more while getting your tattoo. Increased bleeding interferes with the tattooing process by possibly cause loss of ink. You will be asked to complete a Consent to be Tattooed form and to show a valid photo identification with your birth date on it (driver's license, passport, school ID, etc.) You will be asked to complete a health questionnaire, which is designed to determine if you are healthy enough to have a tattoo applied. The artist makes a stencil of the design. Then she will clean and might shave your skin where the work will be done and, will swipe your skin with an "adhesive," which is usually deodorant stick . The artist will then put the stencil design directly on your skin and, when the paper is lifted a stencil line drawing of the design will appear on your skin. She will let you look in a mirror to make sure you are happy with the design and the placement. Once this is agreed upon, the artist will then begin setting up the tattooing work station. The artist will be doing things like dispensing various colors of ink into disposable ink caps, and putting a sterile needle tube set into the tattoo machine. At this time, you will want to try to relax and take a bathroom break. You will probably be somewhat nervous, but excited at the same time. Your body is going through quite an adrenaline rush. Your excited condition and your anxiety about the anticipated pain may trigger a fainting spell. It will help if you are not there on an empty stomach. Eat about an hour or two BEFORE you go in for your tattoo session. The artist will let you know that she is ready to start tattooing. The artist will start up the machine, dip the needle into the ink and let you know that she will start to work on the stenciled outline by starting on a small line that is not noticeable to let you know how it will feel. Don't forget to breathe and relax. The outline is usually the most painful part for most people. Remember that any move you make may cause the artist to make a mistake, so BEFORE you try to move, ask the artist first. Most people can sit through over an hour of work, but if you get uncomfortable, just ask your artist if you can take a break. If you feel light headed or dizzy, tell your artist IMMEDIATELY so they can give you a break and get you some water. Once the tattoo is finished you will get to look at it, then it will be bandaged up and after-care will be discussed. You will be sent home with written after- care instructions. Follow the after-care instruction as closely as possible. Good after-care will make the difference in how your tattoo heals and ultimately how it will look. It is very important to care for your new tattoo properly during the healing period. Never touch the tattoo or the area around the tattoo with dirty hands. Try to wear clean, loose fitting clothes that allow the tattoo to breath and does NOT rub on the tattoo. Do NOT swim or soak in any natural water source such as streams, rivers or ocean until your tattoo is healed. Do NOT expose a new tattoo to direct sunlight it will fade the color. Leave the bandage on for two (2) hours. Wash your hands before touching the tattoo. Remove the bandage and wash your tattoo. The best place to wash your tattoo is in the shower. Using your fingertips wash your tattoo thoroughly removing all surface debris such as ink, plasma and blood. (Do NOT use a wash cloth on a healing tattoo; it is too rough for the tender healing skin) Use a mild fragrance free soap such as glycerin soap. When the tattooed skin feels like normal wet skin, pat dry with a fresh, clean paper towel. Do not soak the tattoo while washing it. Apply a small amount of mild fragrance free lotion to your tattoo whenever the tattoo feels dry. I recommend Curel Daily Moisture Therapy Lotion, Fragrance Free. Remember to wash your hands before applying lotion. Rub the lotion COMPLETELY into the tattoo; do NOT leave globs on the surface. Remember less is more. Reapply lotion to your tattoo 3-4 times a day or when it feels dry. During the healing process your tattoo will flake and peel. The lotion helps prevents drying and cracking that can result in loss of ink. Continue to wash your tattoo daily and apply lotion as needed until healed. Peeling skin is normal just do NOT pick or scratch it! If your tattoo itches slap the skin around the tattoo to relieve itching. Healing time varies, usually 1-3 weeks. If an infection occurs, contact your tattoo friendly physician. While infections are unlikely, they do occur. It begins in a small area looking puffy and grayish. Always use a sun screen or sun block on your tattoo. Direct sun will eventually fade your tattoo. Consistent care and protection of your tattoo will keep the lines sharp and colors bright!